Bebop a male rhino, left, interacts with a female rhino at Gladys Porter Zoo in Brownsville. Bebop is new to the Gladys Porter Zoo rhino exhibition. The next time visitors make a stop at Gladys Porter Zoo in Brownsville, they may be able to see the zoo’s newest member, a 5-year-old Southern white rhino named Bebop. Bebop joined Abby and Julie in the zoo’s crash, which is what a group of rhinos is called. Patrick Burchfield, the executive director at Gladys Porter Zoo, said the staff is excited to have breeding-age rhinos on site. The new rhino arrived at the zoo in March from The Center for Conservation of Tropical Ungulates in Punta Gorda, Florida, but first underwent a 30-day quarantine period before being introduced to his exhibit. Usually, a quarantine period for a new animal may take up to 90 days; however, it was a different case for Bebop. “The fact that Bebop and the two females both came from facilities that have excellent medical staff and veterinary care, we were able to get away with the 30-day quarantine because most of the tests we would initially have to run had already been run,” Burchfield said. After the 30 days, zookeepers placed Bebop in side-by-side enclosures with Abby and Julie to get acquainted. In August, Bebop and Abby were introduced to each other, and two months later, the new rhino met Julie, the oldest female. Burchfield said the zoo staff hopes Bebop will successfully breed with the females to produce healthy calves. Zoo staff will wait for Bebop and one of the females to breed to begin the birth countdown, which can be from 16 to 18 months. Baby rhinos are usually 140 to 150 pounds, Burchfield said. The zoo executive director said Southern white rhinos are the most social of their species. 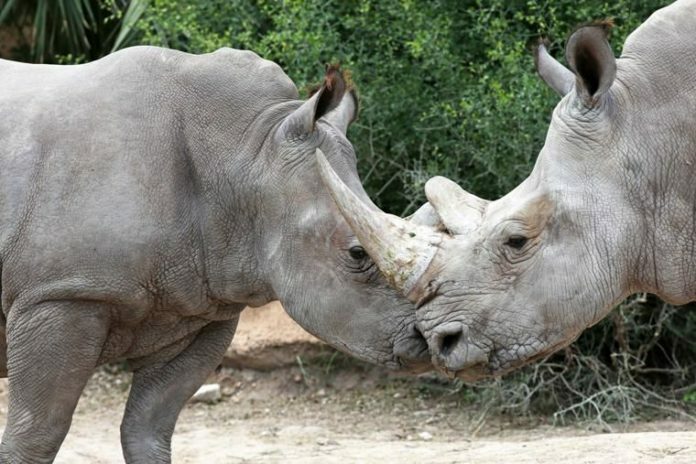 Rhinos may live up to 30 to 50 years in the wild. White rhinos are listed as near threatened by the IUCN List of Endangered Species and their biggest threats come from habitat loss and poaching. Burchfield said rhinos are hunted for their horns and keratin, which is believed to traditional Chinese medicine for some people. “When the Gladys Porter Zoo began, the Southern white rhino was one of the more critically endangered rhinos and that’s why we got into the white rhino business in the first place, but thanks to excellent conservation efforts is South Africa, their numbers are back to where they are the most numerous rhinos now, but they’re still threatened,” he said. The zoo executive director added that he invites the community to visit the new rhino.